Zilyon Publishing :: Fungus Turns Ants Into Walking Dead!!! « Inside zombie brains: Sci-fi teaches science. 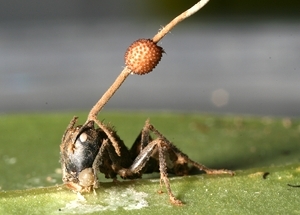 Fungus Turns Ants Into Walking Dead!!! Hold the Mushrooms on that Pizza Pie!!! A parasitic fungus infiltrates the body of a tropical carpenter ant, feeding on it and manipulating its body and turning it into a ZOMBIE!!! The fungus forces the dying ant to the forest understory, an environment more conducive to its growth. The invasion of this fungal body-snatcher culminates with it sprouting a spore-laden fruiting body from the dead ant’s head (See Pic Below)!!! The “Hat of Death” may look perfect for a Royal Wedding, but it is DEADLY!!! Click here to read all about these poor ant bastards!! !